Lasers aren’t just for space age weaponry anymore. Numerous professions, including carpentry, medicine, and dentistry, utilize laser technologies every day. At Indianapolis Family Dentistry, we use the EPIC diode laser to make numerous oral health treatments faster, safer, more comfortable, and more effective. If you’d like to find out more about how our EPIC soft tissue laser has improved treatment in our office, call the team to schedule an appointment. We’ll be happy to show off our high tech treatment tools. What are Soft Tissue Lasers and How do They Work? 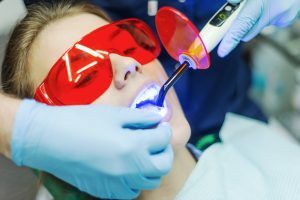 Soft tissue lasers use light waves to perform dental services while simultaneously cauterizing the treated area and encouraging healing and regeneration. The EPIC diode laser is able to provide treatment with minimal discomfort and bleeding, and even more importantly, significantly diminished healing time following care. Our soft tissue laser also has the ComfortPulse setting. This allows us to gradually increase speed to ensure patients are completely free from pain throughout even the most advanced soft tissue laser treatments. What Treatments Use Soft Tissue Lasers? Scaling and root planing – this is the complete removal of plaque and tartar below the gums and smoothing of tooth roots to prevent future buildup for patients suffering from gum disease. Gingivectomy – this is the reduction of the pockets between teeth and gums that enlarge when patients suffer from gum disease. By closing these large gaps, the risk for reinfection and advancement is reduced. Gum recontouring – patients with gummy smiles or stubby teeth may actually need this cosmetic solution to reshape the gums to create a flawless, even smile line. Crown lengthening – prior to the placement of a dental restoration, additional tooth structure may need to be exposed by removing and reshaping the soft tissue. Lesion removal – we may be able to remove aphthous ulcers, herpetic lesions, and other sores and bumps painlessly using our soft tissue laser. Biopsy – if we notice areas for concern during the biannual oral cancer screening, we can use our diode laser to perform a biopsy immediately. Cleanings – we can use the laser system during regular dental cleanings to completely remove plaque and tartar buildup. This is most often recommended as maintenance for gum disease sufferers. Teeth whitening – we can use the laser to lift away stains on the surface and deeper set stains quickly brightening smiles in just one appointment with little or none of the dental sensitivity that often occurs following teeth whitening.